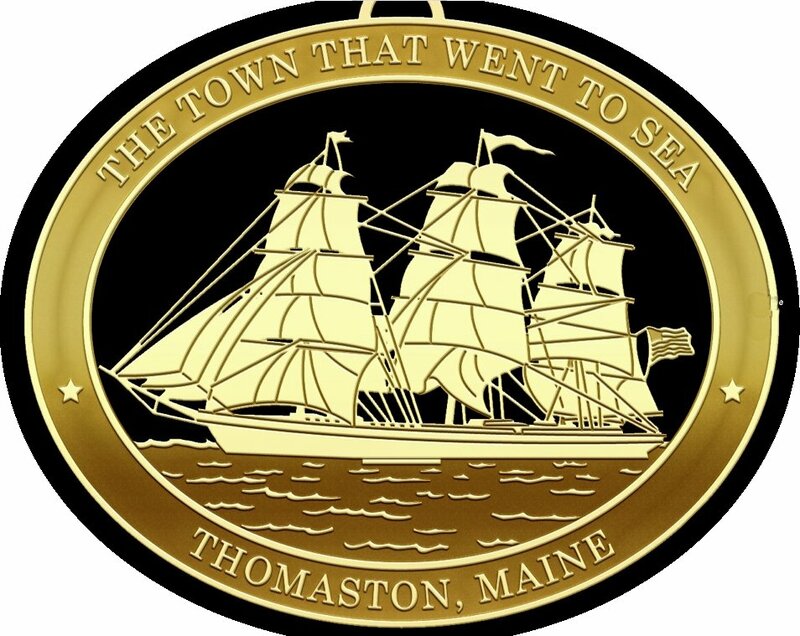 Friday night 5 to 7 P.M.
a live auction at 6 P.M.
and a silent auction on both Friday and Saturday. Saturday, open to the public, no reservations needed. Tour of the house, silent auction. of the Barnabus Webb ship will be available at both events. to the public for this event. The 2014 Home for the Holidays house is unique in several ways from the houses shown in previous years. It has gone through several major style changes during its life. 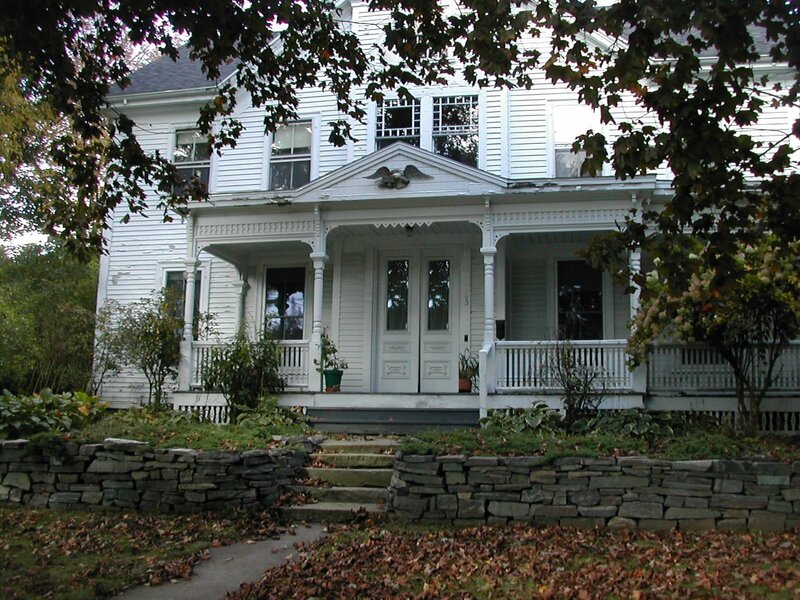 It began as a typical Federal house, then changed in the late 19th Century to look like a Queen Ann Victorian and finally, during the 20th Century, details of a Colonial Revival house were added. All three styles are still present as not all rooms were changed in every remodeling effort and some details from each era can be found, sometimes in the same room. Therefore this house offers a lesson in architectural design, which is quite a different focus from our previous offerings. The visit offers many examples of the original art work by the home's new owner, Reverend Peter Jenks. A new feature: As many of the details of past appearances can be found in both the attic and the huge barn and because the barn is not heated and the attic has no handrails for the stairs, photographs of those details will be running in a loop feed for anyone interested in seeing some of the very rare features and learning what they represent. During the transformation into a Queen Ann Victorian, the lovely front porch was added, including the marvelous gazebo shaped portion on its eastern end. 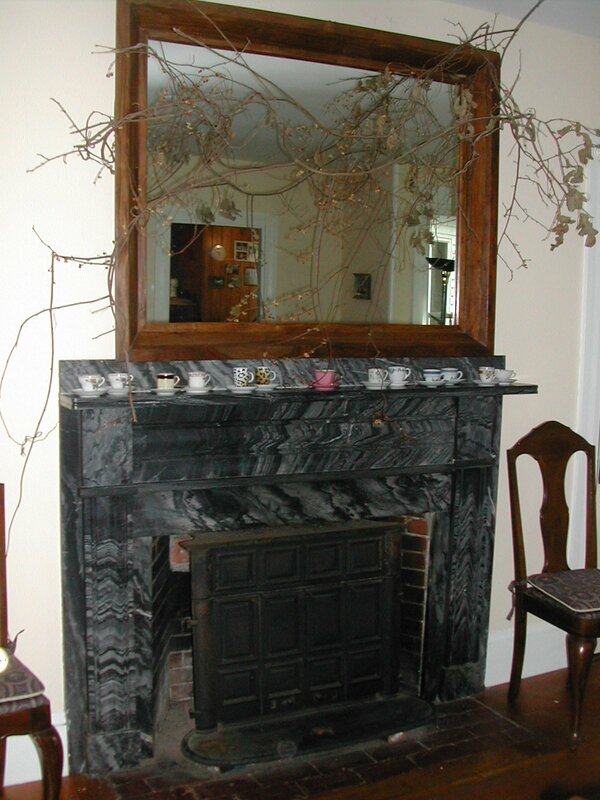 The house has several Thomaston black marble mantles in very different designs unique to this house. 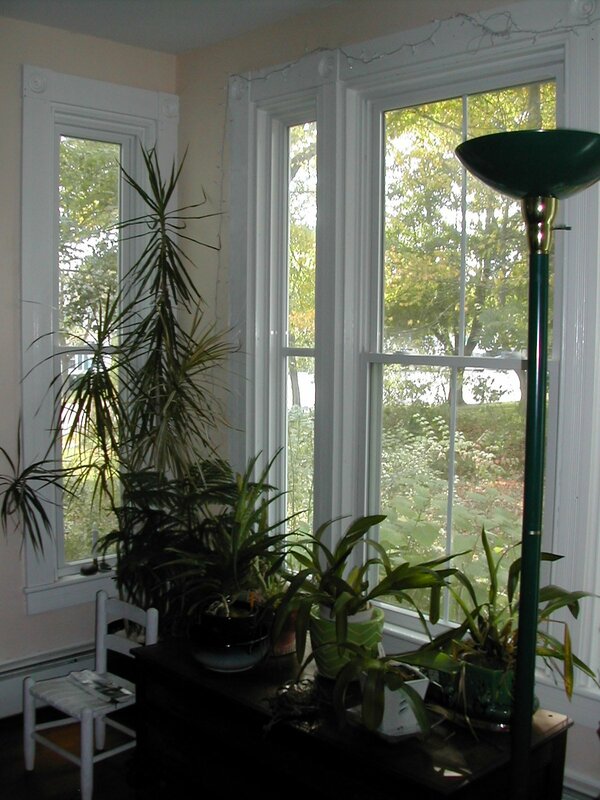 In the dining room lovely box bay windows allow ample sunlight into the room. While this "bump out" is very old, it is not believed to have been original but was added very early in the house's history. The wooden bowl on the staircase's newel post was used as a place to put calling cards. 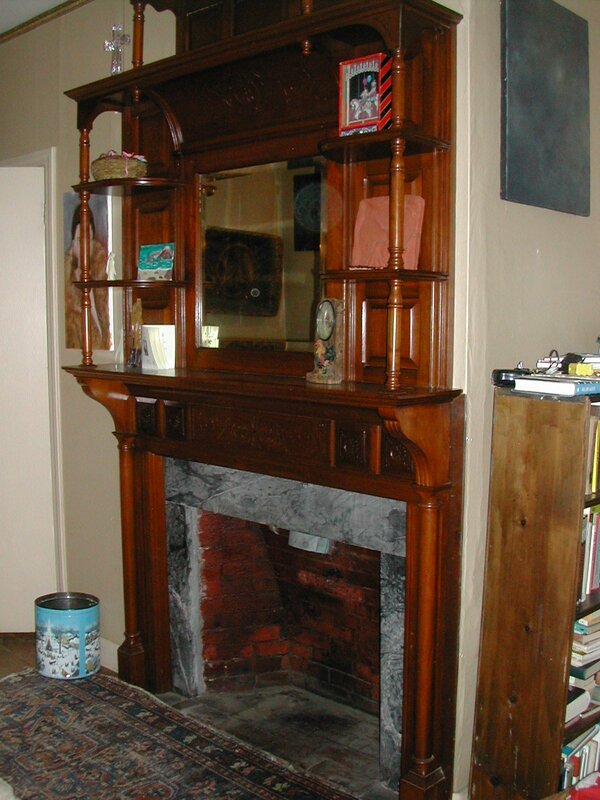 The mantle in the library is made of Honduras Mahogany and is hand carved. The house has dozens of details that are not to be found in other houses including an example of a very early steam radiator, perhaps the first one installed in a Thomaston house. Peter and his wife, Emily, have not been in the house for very long, therefore they have not as yet had time to make whatever changes the house will eventually experience before they are through decorating and fixing the house to meet their needs. Therefore, this house is a "work in progress." The four pictures above are of a front room marble fireplace, the lovely box bay windows in the dining room and the hand carved fireplace mantle in the library. 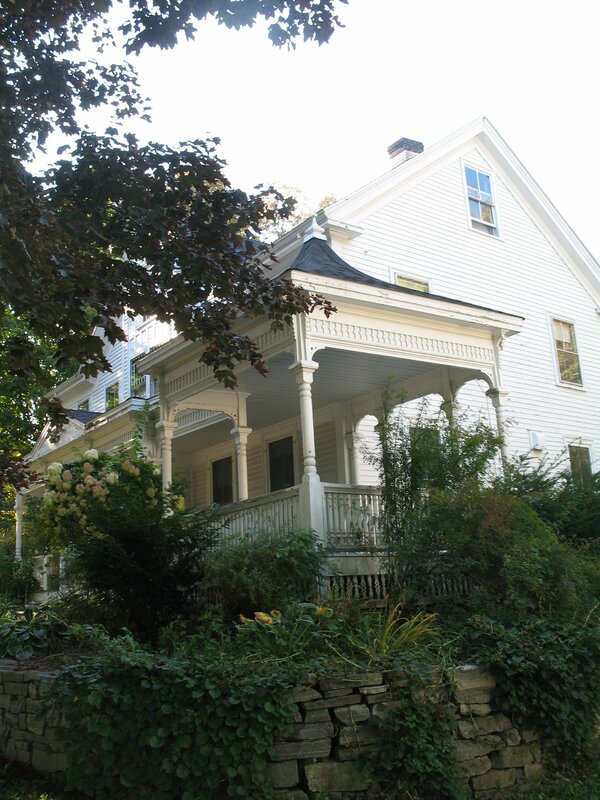 The exterior photograph is of the gazebo style end of the gorgeous front porch.